Whether you’re a customer, potential customer, or just looking, sign up for iRecruit’s monthly newsletter to see what’s new with us. Find out about the latest updates, news, and available training. Sign Up for Email Updates For Email Marketing you can trust. 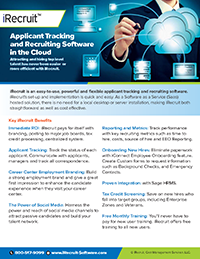 iRecruit customer newsletter February 2018.